One joke going around the blogosphere this morning was that John Kerry was planning on running for the presidential nomination and was responsible for the State Department’s announcement that Hillary Clinton’s email would be released in January–just prior to the Iowa caucus. Subsequently a district judge ruled that the State Department must submit a new schedule with periodic release of the email in order to comply with Freedom of Information Act requests. In other words, the email will drip out, keeping the story alive for months. After failing to comply with regulations to archive her email on government servers, Clinton now says she wants them released more rapidly. I would think at this point she would prefer to have them released ASAP. It is better politically for her to have this all come out now, at this early stage in the campaign, as opposed to either just before the Iowa caucuses (as initially planned by the State Department) or periodically over months as now planned. She probably would have been been better off sending them to the State Department in electronic format, as opposed to printing them forcing the State Department to scan them, slowing down the process. Of course this would not have been an issue if she had archived them with the government at the time as required. It is hard to believe there is anything damaging to her in what will be released. She already went through and destroyed anything she didn’t want released and the State Department also went through the email. It is especially doubtful there ever was anything incriminating on Benghazi. I bet that at worst her email would show the normal fog of war when people legitimately were not certain what happened and different views were honestly expressed, with no evidence of the conservative conspiracy theories. Anything really interesting related to the recent scandals has probably already been deleted. I mean, where to start with this? 1. The vast majority of the people who have asked Clinton questions in Iowa, New Hampshire and Nevada were part of a pre-selected group who sat with her around a roundtable. That’s not exactly like hosting a town hall event in which none of the questions are pre-screened. And if you look at the questions “regular” people are asking Clinton, they are not exactly the most probing of queries. A sampling: “I’m just wondering, what can you do to bring that heart back to education in the United States?” (Iowa), “What are your plans to help my community and help us not live in fear anymore?” (Nevada) and “I would like you to elaborate on what you think you might do for childcare in the future if you’re elected?” (New Hampshire) None of those questions are bad, per se, but they also aren’t pushing Clinton in any way, shape or form on any issue. 2. It makes zero difference how many questions Clinton has asked average Americans. Like, none. If those people were running for president, then I would be super-interested to know how they responded to some (or maybe all) of Clinton’s 117 questions. But, they aren’t. She is. Citing the number of questions Clinton has asked of people to rebut the idea that she isn’t taking enough (or any) questions from reporters is sort of like saying you aced a job interview because you answered every question asked of you with another question. That wouldn’t make sense, would it? 3. At issue here is that Clinton is avoiding taking questions from reporters. And nowhere in the Correct The Record memo does it have anything to dispute that fact. In total as a candidate, Clinton has answered 13 total questions from reporters. 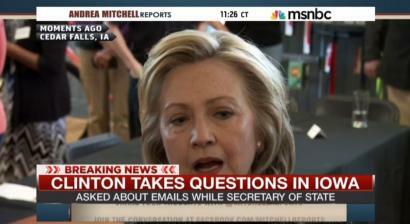 It’s been 39,000 minutes since she last answered a reporter’s question. And, while I think it is absolutely of value for Clinton to hear from regular folks about their concerns and hopes, it’s hard to argue from the list put together by Correct The Record that the questions those people have asked Clinton are the same as the one reporters would have if given the chance. No, they’re better, you say! They’re about policy and not dumb reporters’ obsessions, you say! So, no matter how many Iowans’ questions Hillary answers or how many questions she asks them, it doesn’t justify her current unwillingness to stand before reporters (or even a single reporter) and take their questions. Not even a little. But an examination by The Times suggests that Mr. Blumenthal’s involvement was more wide-ranging and more complicated than previously known, embodying the blurry lines between business, politics and philanthropy that have enriched and vexed the Clintons and their inner circle for years. Note the connection between Media Matters and the Clinton campaign. Media Matters has been responsible for much of the rapid fire, and incorrect, statements to defend Clinton since the story first broke. They also fabricated an attack on Peter Schweizer after came out about the release of Clinton Cash, such as making an unsubstantiated claim that he was not currently working on a similar book about Jeb Bush. That answer reminds of a similar answer that Georgetown hoops great Allen Iverson used to give to reporters when they asked him why he refused to break ties with some of his longtime friends who, in the minds of some, brought an unsavory element to the NBA and clouded Iverson’s ability to focus on being the best basketball player he could be. Iverson’s response was, and I am paraphrasing here: These people were my friends before I got famous, and they’ll be my friends after I stop playing basketball. They are my true friends. I don’t care what any of you think about me or them. Okay. I wasn’t sure — and still am not sure — that that was the right answer for Iverson. But I am absolutely certain it’s not the right answer for Clinton. Iverson didn’t need anyone to elect him to anything to be successful in his chosen profession. So, the opinions of others could cost him money, potentially, but couldn’t fundamentally impact his playing career. That’s the exact opposite of the situation Clinton finds herself in. How she — and the people she surrounds herself with — are perceived matters in a very real way to her future career prospects. When Bill got elected president in 1992, there were a number of people in the Clintons’ Arkansas orbit who national Democrats assumed would be jettisoned when the duo came to Washington. Except they weren’t. Perhaps the best known of this group is Webb Hubbell, a law partner of Hillary’s and close confidante of the Clintons who was named associate attorney general by Bill Clinton. Less than two years later, Hubbell pled guilty to overbilling clients at the law firm ands spent several years in prison. And now, according to this Daily Beast story from 2014, Webb Hubbell is back in the Clinton orbit, although, admittedly, far from its center. If you got tired of all these people, and all the scandals during the first Clinton administration, it will all be coming back, in what I fear will seem more like the third term of Richard Nixon. Posted in Hillary Clinton, Scandals. Tags: Benghazi, Democrats, Hillary Clinton, John Kerry. RSS feed for comments on this post.. TrackBack URL. I don't think anyone needs to ask her any questions because we can't trust anything she says. Like a lot of politicians, she has proven she will pander to any group or ideology. I'd repeal the 22nd amendment and get Bill back for a 3rd term than trust her. Good point that we can’t trust her answers, but I still think there is some benefit in getting candidates on the record and having them give their views on current issues. If we are going to repeal the 22nd Amendment, I’d give Obama a third term before I’d go with either Clinton. You are probably right about getting them on record despite the way they seem unconcerned about flip flopping. I can't help but admire Bill for having at least had a balanced budget once. I understand you differ from me in the value of adding trillions more debit for things like shovel ready jobs. I just heard Bernie Sanders last night, if only the government would spend more on infrastructure. I believe it was Margaret Thatcher who said something to the effect that ideas like that don't work because you always run out of other people's money. It sounds like Thatcher might be ignorant of basic economics, such as the benefits to the economy of spending on infrastructure and the multiplier effect of government spending. You can live on a desert island with zero taxes and zero spending on infrastructure. That is not likely to lead to a very strong economy. Government spending on infrastructure is both necessary for a working economy, and will further stimulate the economy. This leads to greater income, and higher tax revenues. Conservative economics do not work in the real world. The multiplier effect you reference is not always beneficial. As one put it, you could pay your neighbor $100 to dig a hole that you fill back in. Then your neighbor could pay you that $100 to dig a hole that he fills in. Thus 2 jobs and $200 of GDP from $100 but little to no real improvement. Whether deliberate payoffs to their friends or just overly confident in things they can't predict, big spending by govt never seems to produce the results they promise. Of course government spending is not always beneficial. It has to be done sensibly. The claim that “big spending by govt never seems to produce the results they promise” is just a conservative talking point which is not supported by the facts. This is true of some government spending–typically the poorly managed spending under Republicans. We have seen far better success when government spending has been done in a more sensible matter under Democrats. This includes the tremendous success of Obama’s stimulus program which saved the economy after the Republicans crashed it. Republicans just claim that government doesn’t work after it doesn’t work under Republican controlled governments as Republican economic ideas are fundamentally flawed, based upon ideology as opposed to actual economic data.